The Great White is a 40' x 12' custom built steel hulled vessel powered by twin inboard V8 engines, and was built with the diver in mind. The rear deck is fully enclosed with canvas for diver protection from the weather and may be removed if required. 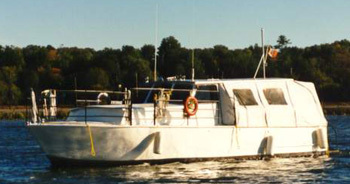 At the stern of the boat is a walk through transom which leeds to a 4' wide dive platform that is low to the water for easy water entries and exits. There is a 7' long open-ended t-bar ladder for easy diver exits with equipment on (no more fin removal to exit the water) . Along the starboard side of the boat just under the water is a pull rail which assists divers from the stern of the boat to the ascent/decent line at the bow, (no more straining with that piece of rope). Forward and below is a cabin area with a head and a place to store your clothes and valuables if desired. The Great White can accommodate up to 12 divers. Wayne Plumb, c/o U&I Scuba Inc.